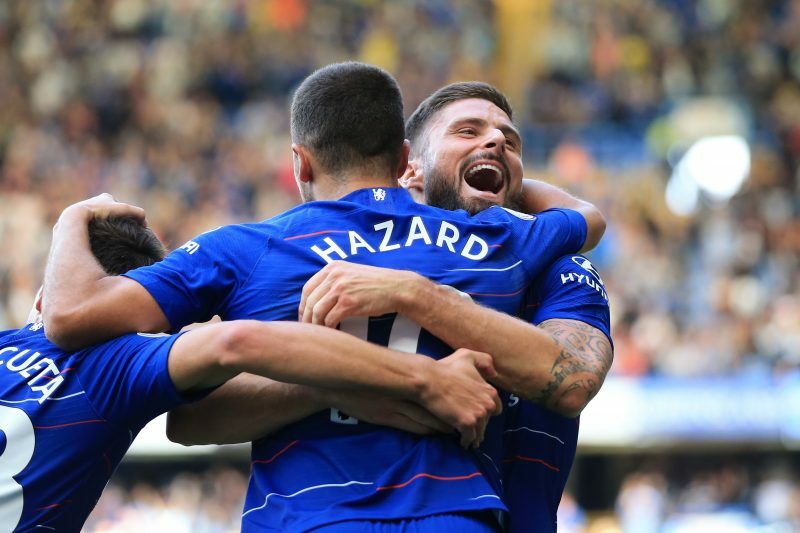 The Premier League returned to Stamford Bridge after this season’s first international break came to its close this weekend, as Chelsea hosted top-flight new boys Cardiff City in Saturday’s mid-day kick-off. The Blues suffered a shock start to the game as Souleymane Bamba opened the scoring after just 16 minutes of play. It was the first time Chelsea saw themselves chasing the game this season, but it didn’t take long for the Blues to take grip of the clash. Maurizio Sarri’s men pressed from high, passed the ball around quickly and created several goal-scoring chances right after conceding. Mateo Kovacic was close to scoring a lovely goal after a brilliant link-up play with Pedro and Olivier Giroud, but Cardiff goalkeeper Neil Etheridge made a stunning save to deny the Croatian. Pedro and Giroud also had a few chances to score themselves, but it was the man in sublime form, Eden Hazard, who carried the Blues back on track. The Belgian international played a lovely one-two with Giroud before going past the Cardiff defenders with pace and firing a powerful strike into the bottom corner of the net. Chelsea were even after 37 minutes of play, but Hazard and the rest of the team didn’t settle for that. Only five minutes after his first, Hazard buried in his second from another Giroud assist. The Frenchman, who made his first start of the season today, could become a regular starter under Sarri should he continue to perform like this. Alvaro Morata, who sat on the bench throughout the game, is still yet to really impress the new manager this term. Instead of holding onto the 2-1 lead, Chelsea went on to chase the third. Willian came on from the bench and made a huge impact right after, earning a penalty for Chelsea 80 minutes into the game. Hazard took the chance for a hat-trick and made no mistake from the spot (as usual), sending Etheridge the wrong way with his strike. Hazard might have scored three goals today, but the most beautiful goal of all was the fourth – a stunning long-range curler from Willian into the top corner of the net! Just four minutes after Chelsea’s third the Brazilian bagged his first goal of the campaign in great fashion! With this victory Chelsea surpass Liverpool on top of the Premier League table and extended their winning streak to five games. The Blues travel to Greece on Thursday, facing PAOK in the first tie of the Europa League group stage. Come on Chelsea!